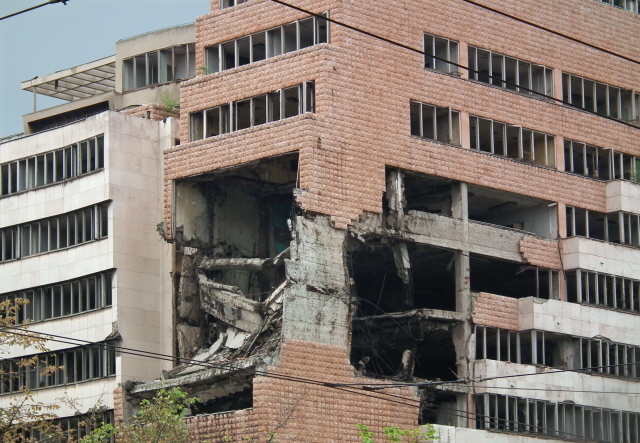 A number of large buildings that still bear the unmistakable signs of damage inflicted on them by the NATO bombing of Belgrade in 1999. Stunning sights on a scale not otherwise seen anywhere else in Europe (except now in eastern Ukraine, I presume, but those parts are of course out of bounds for tourists). More background info: see also under Serbia. 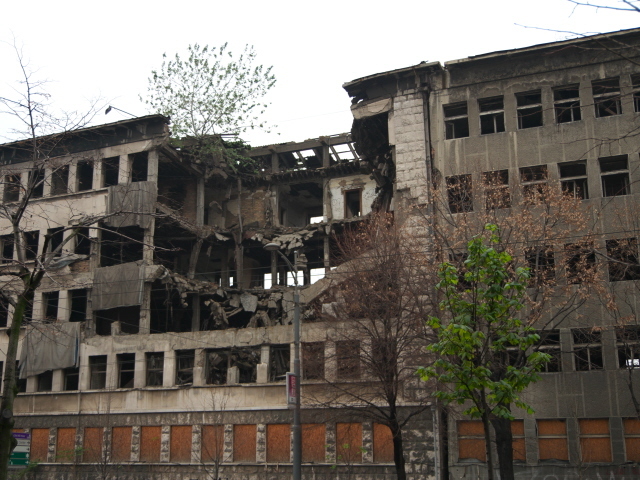 The bombing campaign by NATO against the then remaining Yugoslavia (basically just Serbia and Montenegro – as they then proceeded to call their "federation" until its final demise in 2006) during the Kosovo war in 1999 initially followed an approach of only taking out military targets and supply lines in "surgical strikes". But that didn't lead to the expected success in the form of the Milosevic regime backing down (on the contrary!). At the same time the refugee crisis in/from Kosovo only intensified dramatically after the bombings began ... something that is often forgotten in the West, with the chronology of events getting confused. So NATO then stepped up the bombing to also strike decisively at major "dual use" infrastructure, i.e. those of use for the military as well as for civilian purposes such as refineries, power stations or bridges across the Danube. Telecommunication and command centres qualified too. 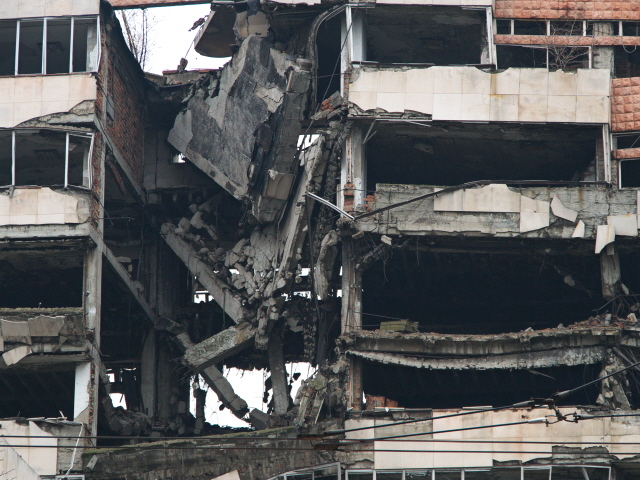 As such, even central Belgrade became a target as well. 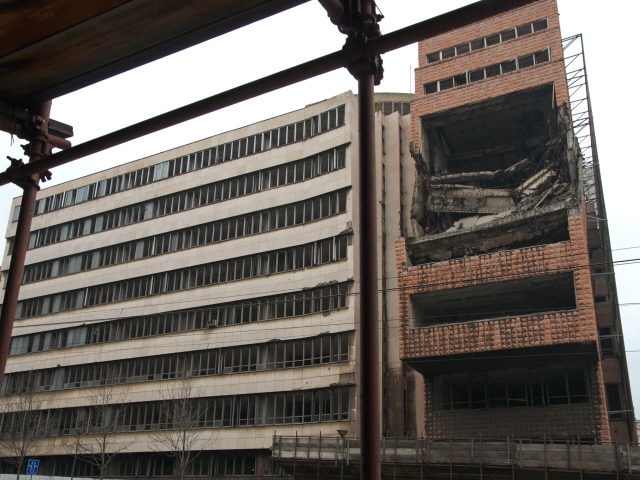 In the city centre, government buildings came under attack by cruise missiles, such as the former Ministry of the Interior/Army HQ buildings. 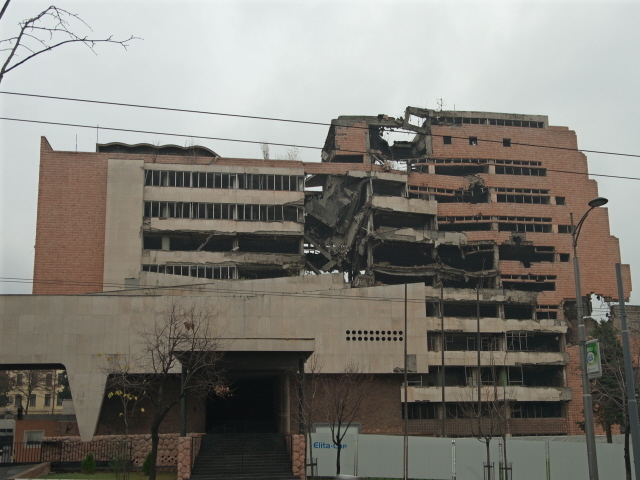 More controversially, the TV centre next to Tasmajdan Park was also bombed, killing several civilian employees. 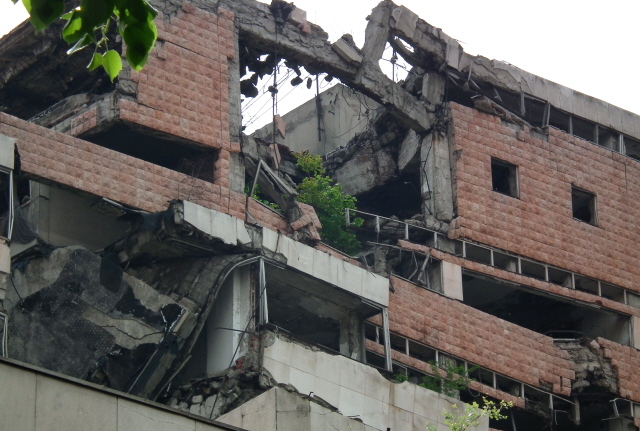 Other bombings also caused such civilian "collateral damage", but the bombing of the Chinese embassy in Belgrade turned out to be the most embarrassing for NATO and the USA, who, as usual, led the campaign. Officially, the bombing was afterwards declared to have been a regrettable intelligence mistake. However, doubts and counter-claims remain to this day. But perhaps the most painful loss from Belgrade's own perspective was that of the city's distinctive Avala TV tower, the tallest and most iconic structure destroyed in the whole conflict. 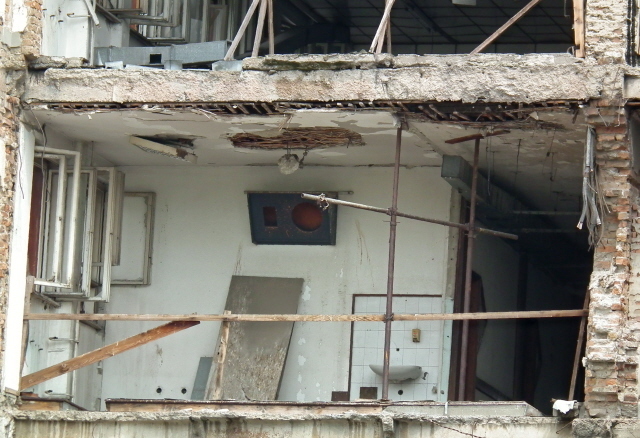 Its destruction was also controversial, as the military usefulness of the facility was debatable, even though the TV network was heavily involved in spreading pro-Serbian, anti-Kosovo and anti-NATO propaganda! It could well be that the symbolic value of the tower was more significant in the decision to target it. The TV tower has since been reconstructed, to be, again, the tallest structure in the Balkans, at nearly 700 feet (205 m). The bombed-out ruin of the Chinese embassy, as I understand, has recently been cleared away to make space for a new housing complex. But the ruins of the bombed TV centre and government buildings in the city centre still stand. 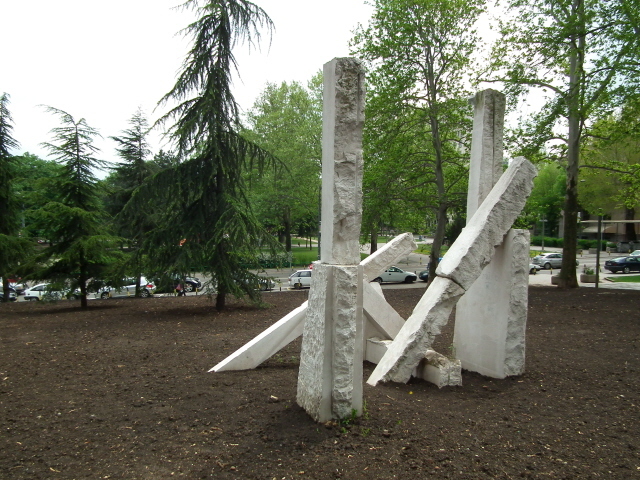 The latter has become a kind of memorial – with a memorial stone in the park next door commemorating and lamenting the loss of civilian life in the bombing. 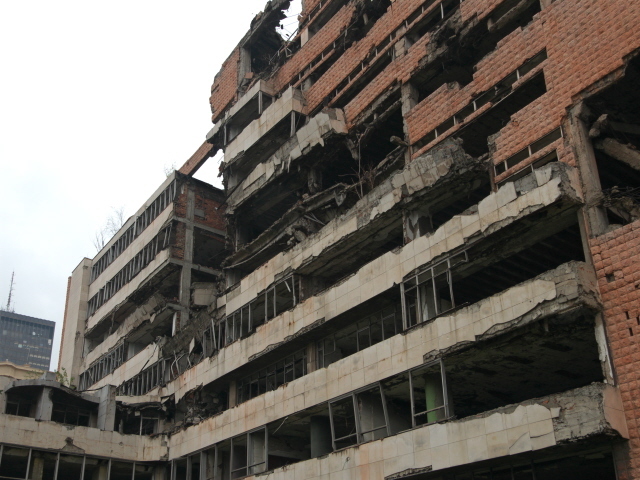 It's unclear what's to become of the ruined government buildings, though. They are clearly not considered memorials – in fact there are soldiers guarding them who may not take too kindly to tourists taking photographs (so you'd have to be a bit discrete!). Nor have they been demolished. I have not been able to find out whether there are any plans for their future (does anyone know ? If so, please contact me!). I'd say, make them proper dark tourism sites, commodify them – even charge admission – but please do not deprive the city of these almost unique and extremely dramatic sights! UPDATE December 2015: just back from another weekend trip to Belgrade. And I found that the more centrally located ruins are now even marked on tourist maps. I also didn't encounter any problems with taking pictures of these buildings any more. But at the bottom end of Kneza Milosa Street, there were still guards who eyed me with suspicion. One of the ruins at the bottom end of that street, which I had still seen from the bus on my first trip in 2011, is undergoing some kind of redevelopment and was fenced off … it looked to me like it might be in the process of being demolished altogether. What there is to see: The most striking of the stricken buildings are those on Kneza Milosa street, the long wide boulevard that leads south from the city centre. Of these the two huge complexes, partly clad in red, either side of the corner of the intersection with Nemanjina street, are the most central and at the same time most awesome of all of Belgrade's war ruins, though at least one of those at the bottom of Kneza Milosa street isn't bad either. Try not to draw too much attention to yourself: there are guards at the corner, and occasionally they also parade up and down the street. Especially when photographing be discrete – as these guards/the police could get twitchy about people taking pictures here. So look around first and pick a moment when you are not being watched, or take cover behind a tree or something. UPDATE 2015: it now seems to be accepted that people are interested in these ruins – and take pictures. On my recent return trip, I encountered no problems, and lots of people were photographing the ruins. The main facade of the southern one of the two ruins on Kneza Milosa, however, was largely covered by a giant billboard, and parts of the ruined foyer/entrance building I had seen in 2011 were gone. Instead there was now a plain lawn in front of the building. (UPDATE May 2016: I've just been informed that demolition has begun on the northern one of these two builings. !!! UPDATE September 2016: apparently this was false alarm. The same source has now told me that the work being undertaken at the site is not demolition but instead intended to stabilize the ruins so they don't collapse, and that they are to remain in place as memorials/attractions. Good news!). One ruin I had spotted from the bus at the bottom end of Kneza Milosa also appeared to be undergoing “redevelopment”, probably demolition. The one across the street, however, was still there and looked like nothing had been done to it since it had been boarded up. A tree was growing from the edge of the collapsed part of the roof. 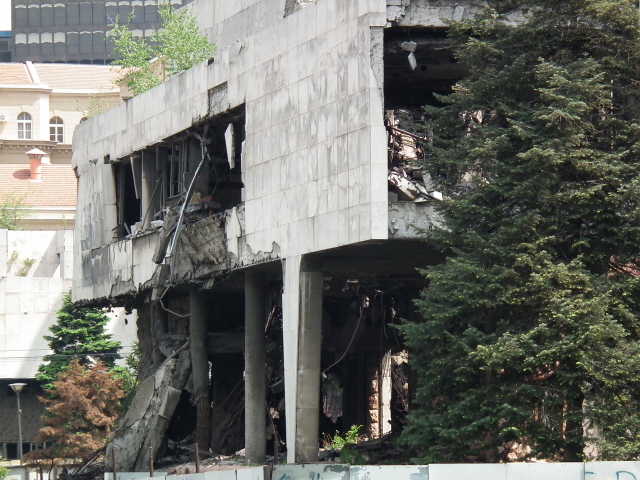 There does not seem to be any problems at all with viewing the ruin of the bombed TV centre at Tasmajdan Park. There's an official memorial stone here too, after all – and that's clearly intended to be noticed. At the bottom of the memorial stone is a photo taken after the attack, showing rescue workers in the midst of the smouldering rubble. The building today is basically the side of a house without a façade, so you can look in. Look closely and you can spot hand-wash basins and the chassis of an audio monitor (sans speakers) on the wall where some kind of studio room must have been. Further into the park try and spot the "children's memorial" – a simple stone with a bilingual inscription in Serbian and English, pronouncing: "dedicated to the children killed in NATO aggression 1999". On top round and egg-shaped parts appear to balance on the base stone and larger inscriptions reads "we were just children" – clearly intended to underscore the accusing tone of the memorial even further. Towards the bottom of the park, near Beogradska, stands another monument that may or may not be related to the destruction of 1999 – at least it looks vaguely similar to some of it, like partly collapsed concrete pillars. This is basically it. 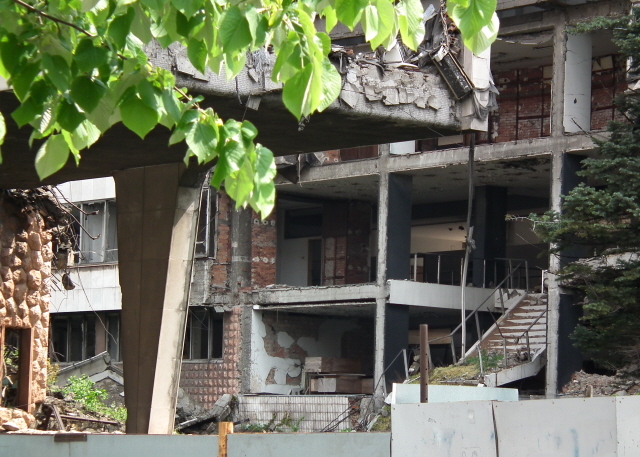 The ruin of the bombed Chinese embassy on Tresnjin Cvet Street in New Belgrade's Block 11a has apparently been cleared away recently and replaced by new housing – so that's a lost site, from a dark tourism perspective. Making your way all the way out to its former location is therefore really only for the very determined. The same is partly true for the Avala TV tower. That is to say: the ruin of the tower has also been cleared away, but in its place an exact copy of the original tower has been reconstructed between 2006 and 2010. It is – again, and now even more so (defiantly) – a proud symbol of Belgrade. Though no longer a dark site as such, being new and intact ... and in use as a mainstream tourist spot. But you can at least go there and try to imagine (darkly) what a dramatic site it must have been when such a concrete behemoth had collapsed! 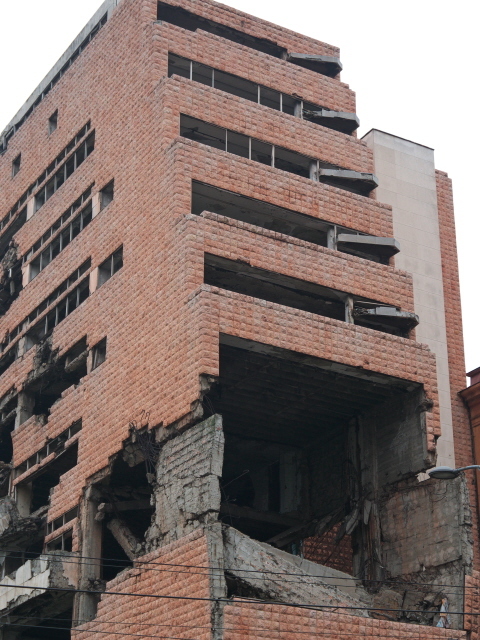 Locations: The most dramatic bombed ex-government buildings on are located on the corner of Kneza Milosa and Nemanjina streets. More ruins are to be found further down towards the bottom of Kneza Milosa near the huge intersection with the motorway. The TV centre ruin and memorial stone are in the northern corner of Tasmajdan Park behind the large Sv Marka church and the small Russian chapel nearby. 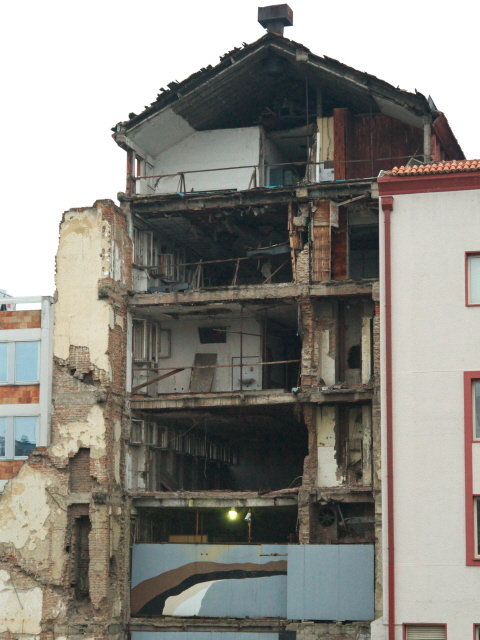 The former site of the bombed Chinese embassy was at Block 11a in New Belgrade on Tresnjin Cvet Street. The Avala TV tower is located a few hundred yards north of the Memorial Tomb of the Unknown Soldier on the hill of the same name, which is ca. 9 miles (15 km) south of central Belgrade. Access and costs: in theory freely accessible and viewable from the outside (only). Details: The ruins on Kneza Milosa are (were) easy to find: just walk the street down from Pionirski Park with its palaces and the Parliament building opposite – or, from the train station, walk up Nemanjina until you get to the intersection with Kneza Milosa. 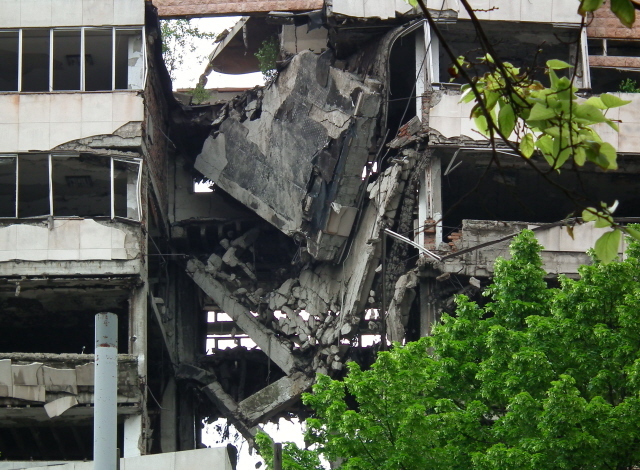 The damaged TV centre is best to be viewed from Tasmajdan Park's northernmost corner. To get there from the city centre, first make your way past the front of the House of Commons and towards the red brick and copper-topped towers of the Sv Marka church, walk round it, head left and proceed past the small Russian chapel. In the corner of the park behind the chapel is a (music) school, and from the elevated spot outside its entrance you get the best view of the TV centre ruin. The monument to the victims is right here too. The children's memorial is further into the middle of the park. Getting to Avala is much more of an expedition: first take the No. 9 tram all the way out to Vozdovac and then bus No. 400 to the top of the mountain (weekends and May to September only). To get to the site of the former Chinese embassy (though there is really little point in doing so) take the No. 72 bus, the same line as to/from the airport, and get off at a stop by the YU Bizniz Centar (a striking building with weird red metal balconies and steel pipes protruding from its façade, a short distance west from the sprawling Palace of Serbia site en route out of the city centre); then walk up Tresnjin Cvet Street. Time required: Just viewing the damaged buildings on Kneza Milosa doesn't take much more than a few minutes each. Similarly the ruin of the TV centre building. Add a few extra minutes to seek out the monuments in the adjacent park. Getting to Avala will take considerably longer, all in all a half day trip at least. The detour to the site of the former Chinese embassy less so … you'd only waste up to an hour or so on that. Combinations with other dark destinations: in general see Belgrade – in particular, for more on the 1999 war, including some proudly presented trophies of pieces of wreckage of shot-down US war planes and such like, see also Aviation Museum and Military Museum. Combinations with non-dark destinations: see Belgrade.